Virat Kohli ended the Test series with 692 runs at 86 but he said was most pleased by the character shown by his teammates, even as India lost the four-match Test series against Australia despite fighting to force a draw on the 5th day in Sydney. "I am proud of the way we played in this series. The guys have stepped up to show real character and determination in Australia. 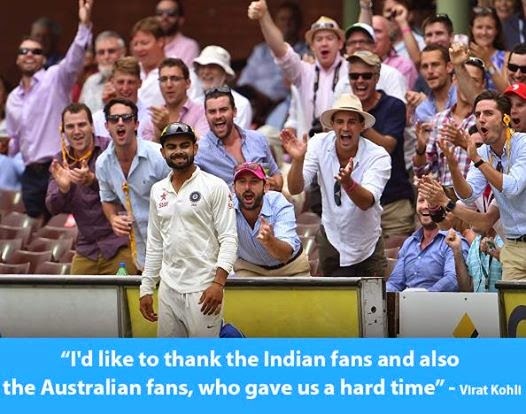 In Australia, it is never easy," Kohli said during the post-match presentation. The Indians fought hard in the series despite suffering a 0-2 reverse. In Adelaide, the Kohli-led team decided to go after the target of 364 on a crumbling final day track and fell 48 runs short. They were on-course for a first innings lead in Brisbane before Mitchell Johnson turned the game around with the bat and the ball. They shored up well in Melbourne and Sydney to eke out draws but Kohli hoped that the Australian team viewed this Indian team as worthy competitors. "It could have gone either way," he said. "I am sure Australia would have enjoyed the competition as well." Speaking about the final day's play in Sydney, the Indian captain said that he wasn't sure if he wanted to go for the target at tea and credited Ajinkya Rahane for shepherding Bhuvneshwar Kumar to see out the remaining overs and force a draw after a point of time when defeat became a strong possibility. "At tea time, I was not 100% sure if we wanted to go for the target. After (Murali) Vijay got out, I thought we could go for it as we wouldn't be coming back here (to play Tests) for sometime now. If it does not happen, it does not happen, but it's worth taking the risk," he said. "Our second innings was a mixture of intent and patience. Ajinkya Rahane showed a lot of character and determination at the end. Eventually, it was a satisfying result but a win would have been better," Kohli said. The new Indian Test captain also identified the bowling as an area of improvement for the side and said that he had instructed his bowlers to learn from the opposition. "The batsmen have stepped up but the bowling needs consistency. What matters at the end of the day is taking 20 wickets. Spinners have been our strength in the past and we have to back our strengths. The Australian bowlers know how to set-up the batsman and we have to learn from them. We need to take somethings from the opposition," he said.